A company can split or consolidate the number of shares they have in circulation at any time they wish. The primary reason for doing so is to adjust liquidity of the stock. In addition, many companies perform consolidations when they opt to carry out a return of capital or other corporate restructuring. The consolidation serves to off-set the drop in the share price caused by the sudden drop in capitalisation of the company. 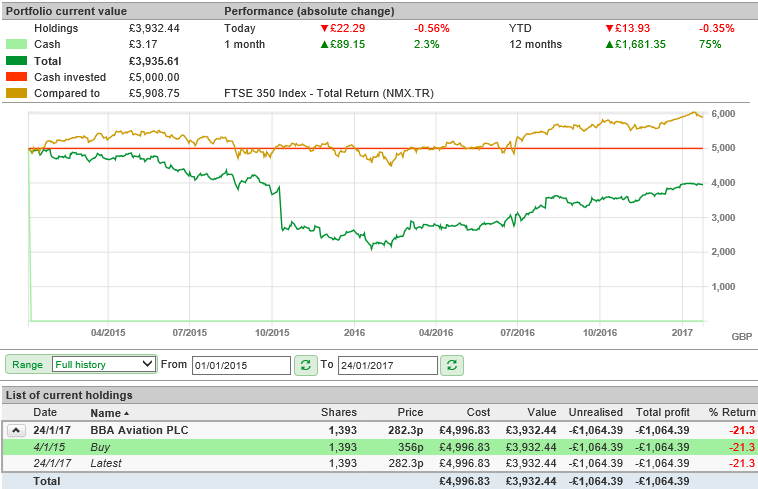 Select the correct share selected in your portfolio table on the blue side of the screen. Select the pale green Add tran button from the bottom of the Trans view. Select Add transaction from the menu. 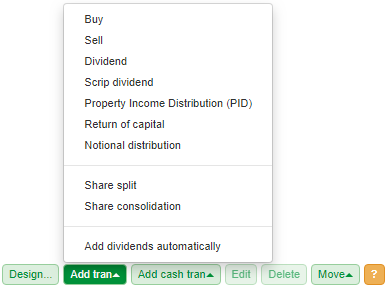 Select Share split or Share consolidation from the menu. The dialog will automatically populate with the number of shares you currently hold. You can then either opt to add either the Ratio or the New Number of shares. 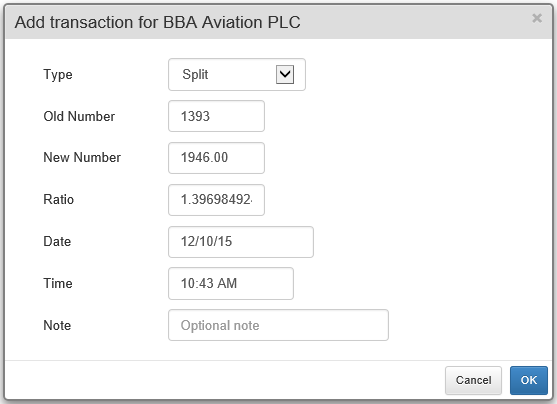 If you add the New Number of shares then the Ratio will be automatically calculated, as shown above. Similarly, if you add the Ratio, then the New Number of shares will be calculated. From a transaction point of view, splits and consolidations are the same thing. The only difference is a split has a ratio greater than 1 and a consolidation has a ratio less than 1. So if you do open the dialog as a Consolidation and enter a ratio greater than 1 then the dialog Type will switch to show Split rather than Consolidation and vice versa. In the example above, the company's shares were split so that you received 1.397 new shares for each old share you held. However, applying the ratio would give you a fractional holding so the correct holding has been entered instead. If you are unsure of the ratio used, this can found by clicking on the Adjustment periods button in the Prices view. The table is contracted to just show any price adjustments that have been made over the history of the share. In this example, the adjustment on 9th October 2015 was 0.71559. This is the inverse of the value you need to use in your transaction and is also listed on the previous date. So in this case, the adjustment on 12th October 2015 was 1.397 (1/0.71559). 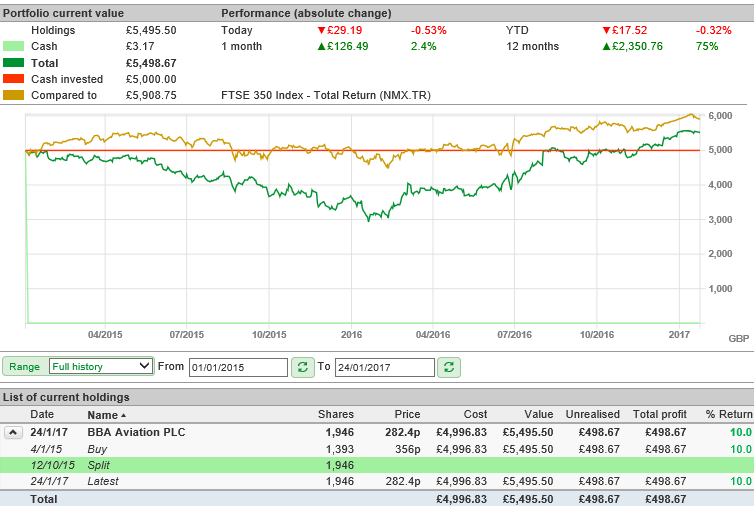 Prior to recording the share split, there is a significant drop in the dark green line Total line in October 2015, suggesting that the holding is making a loss. However, once the split has been applied, the drop is no longer present on the Total line and the holding is in profit.